Beautifully engraved SPECIMEN certificate from the Modine Manufacturing Company. This historic document was printed by the Republic Banknote Company and has an ornate border around it with a vignette of an eagle. Modine Manufacturing Company was founded June 23, 1916, when Arthur B. Modine opened a one-room office adjacent to a small workshop in Racine, Wisconsin. Mr. Modine's "Spirex" radiators became standard equipment on the famous Ford Model "T". When he died at the age of 95, he had been granted a total of 120 U.S. Patents for heat-transfer innovation. This innovation remains the cornerstone of Modine. Since its modest beginnings, Modine Manufacturing Company has maintained a tradition of leadership in heat-transfer technology. 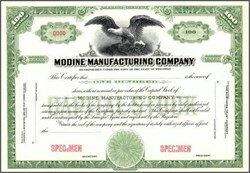 Modine Manufacturing Company became a public corporation in 1928, issuing 100,000 shares on the Chicago Stock Exchange. In the 1930s, the company moved to its current site in Racine and began expanding by opening manufacturing sites in other parts of the U.S. In keeping with the innovation and technology leadership spirit, a vehicular wind tunnel large enough to test a full size heavy-duty truck or bus was built in Racine in 1940. Manufacturing continued in Racine until 1970, when the last manufacturing was moved out of the Racine facility to other locations, leaving Racine as the corporate headquarters and research and development center. Several facilities outside of the US were established in the 1980s, including joint ventures in Canada, Holland, Austria, Germany, Mexico and Japan. In the late 80s, the company purchased 100% equity in the German and Holland joint ventures. Modine Europe was established in 1990 and grew in 1993 with the acquisition of L�ngerer & Reich, an independent German heat transfer company founded in 1913. Today business outside of the US accounts for 45% of our sales. Investing in the Modine vision of global heat transfer technology leadership, construction was completed on a new technical center located in Racine and construction was started on a new technical center located at our European headquarters in 1999.